The human spine is 18 inches long and made up of 33 vertebrae that extend from the neck down to the pelvis forming the vertebral column. Between each vertebrae are disks that are made up of cartilage to help cushion the spine and give it flexibility to generate movement of the body. The vertebrae serve to protect the spinal cord which runs from the bottom of the brain stem down to the backbone through the middle of the spine. At its most basic function, the spinal cord serves as a reflex center consisting of 31 pairs of spinal nerves that are responsible for delivering nerve impulses between the brain and the rest of the body. Together the brain and the spinal cord constitute the central nervous system, where the brain processes sensation and motor signals and the spinal cord transmits them to the muscles in the body. In other words, the spinal cord functions as the messenger between the brain and the body, by relaying vital information from the brain to the body about how the brain needs the body to feel and react. When the spinal cord is injured, its function of coordinating body movement and sensation is impaired, the damage to the spinal nerves diminishes the ability to send and receive nerve impulses from the brain to the muscles of the body that control motor, autonomic and sensory function. If you or someone you love has suffered a spinal cord injury as a result of another person’s negligence, understanding the basic anatomy of the spinal cord will be the first step to establishing your personal injury claim. After all, without knowing how the spinal cord is supposed to function, we cannot possibly assess the extent of the damage the injury has caused you. At San Diego Injury Law Office, our spinal cord injury lawyers are very knowledgeable of the intricate functions of the spinal cord and experienced in assessing the damages of these specific type of injuries. Give us a call today at (619) 343-2992 for a free consultation to review the basis of your personal injury claim and the extent of your injuries, we want to do everything in our power to protect your rights as a personal injury victim! Spinal cord injuries can occur by way of dislocation, compression, fracture or hyperextension, damaging parts of the discs or ligaments surrounding the cord. However, it is the bruising, stretching or tearing into the spinal cord tissue that actually damages the spinal nerve cells, resulting in the loss of mobility and sensitivity below the injured section of the cord. The spinal cord consists of four distinct levels which are assigned cord numbers in descending order for the vertebrae that are located in each level. Generally, the higher the level of the injury to the spinal cord, the more severe the damage will be to the spinal nerve cells. These distinctions are important because knowing the level of the spinal cord in which the injury occurred will also help us determine which part of the body has been affected. The first level is the cervical spinal cord, this is the section at the top of the spinal cord that connects to the brain stem and is made up of vertebrae C1-C8, which are responsible for transmitting signals to the back of the head, neck, shoulders, arms, hands and diaphragm. Given the proximity of the cervical spinal cord to the brain, damage in this level would result in the most severe injuries because it could affect all levels below it. For example, loss of strength in arms and legs, paralysis to the extremities of the body, respiratory issues, issues with your bodily functions and sexual dysfunction. The second level is the thoracic spinal cord, this is the middle section of the spinal cord and is made up of vertebrae T1-T12, which are responsible for transmitting signals to the abdomen and the back muscles. Given the additional protection offered by the rib cage in this part of the body, spinal cord injuries are unusual at this level. When they do occur, it can cause loss of strength in the legs, loss of physical sensation, issues with your bodily functions and sexual dysfunction. The third level is the lumbar spinal cord, this is the section at the bottom of the spinal cord where the lower back turns inward, it is made up of vertebrae L1-5, which are responsible for transmitting signals to the lower abdomen, lower back, external genital organs, buttocks, and legs. Spinal cord injuries at the lumbar level could result in loss of strength or paralysis in the legs, loss of physical sensation, issues with your bodily functions and sexual dysfunction. The fourth level is the sacral spinal cord, this is the section that extends from the pelvis to the end of the spinal column and is made up of vertebrae S1-S5, which are responsible for transmitting signals to the thighs, external genital organs, lower part of the legs, and feet. Spinal cord injuries at the sacral level could result in loss of strength or paralysis of the hips and legs, loss of bodily functions and sexual dysfunction. Given the multiple functions the spinal cord provides, this means that an injury to a single vertebra may result in damage to a person’s reflexes, movements, sensations, and bodily functions, making it impossible to breathe, stand, walk, move, eat, or use the restroom on your own. If you are someone who experienced trauma resulting in a spinal cord injury that was caused by another person’s negligence and now find yourself unable to conduct your everyday life, you need to seek legal representation from an experienced spinal cord injury attorney. At San Diego Injury Law Office we understand that the trauma you experienced has forever changed your life, but you do not have to struggle with the consequences of this tragic injury on your own. Our experienced spinal cord injury attorneys are here to help you every step of the way by making sure our medical experts assess your injuries early on, you receive the medical attention that you deserve without fear of outrageous medical costs because we will do everything in our power to make sure that we hold the negligent party accountable for your tragic injury! It is important that you understand that while there may be multiple spinal cord injuries, they are typically separated into two major categories based on the severity of the injury, incomplete for the less severe spinal injuries and complete for the more severe spinal cord injuries. As the name implies, complete spinal cord injuries are those injuries where the spinal cord has been fully severed and the ability to convey messages to and from the brain is completely lost, taking away the victim’s sensation and motor function below the level of the injury. Victims who suffer complete spinal cord injuries will typically experience total paralysis, no feeling, phantom pains, complete loss of motion on both sides of the body and issues with bodily functions. There are varying degrees of paralysis that fall in the complete spinal cord category, from less severe paraplegia which results from injury in the thoracic, lumbar or sacral level of the spinal cord causing an extensive loss of sensation and total loss of motor function from the waist down, to most severe quadriplegia which results from injury in the cervical level of the spinal cord causing total loss of both sensation and motor function in arms and legs. Whereas, incomplete spinal cord injuries are those injuries where the spinal cord’s ability to convey messages to and from the brain is only partially compromised, allowing the victim to retain some sensation and motor function below the level of the injury. Victims who suffer incomplete spinal cord injuries will typically experience partial paralysis, limited feeling in certain parts of the body that cannot be moved, more movement in one limb than another or more functioning on one side of the body than the other. There are varying degrees of spinal cord injuries that fall in the incomplete spinal cord category, from a posterior cord syndrome which damages the nerves in the back of the spinal cord causing poor coordination but the body retains both sensation and motor function, to a cauda equina lesion which damages the nerves located between the first and second lumbar levels of the spinal cord causing a loss of sensation but not affecting motor function, to a central cord syndrome which damages the nerves in the center of the spinal cord causing a loss of sensation and motor function in the arms but it is possible to retain motor function in the legs. Determining which of the two categories your spinal cord injury falls into will be crucial for compensation purposes because the severity of the injury and extent of loss will help us establish the value of your claim. To learn more about what legal avenues are available to you after a tragic spinal cord injury please give one of our expert spinal cord personal injury lawyers a call today at (619) 343-2992 so we may begin discussing the merits of your claim! The most common cause of spinal cord injuries is trauma, not surprisingly the leading cause for traumatic spinal cord injuries in San Diego are motor vehicle accidents. These accidents generally occur because of a driver’s negligent operation of their vehicle on the road. Under a negligence cause of action, the injured plaintiff has to prove the elements of duty, breach, causation and damages in order to recover from the negligent defendant. In California, a driver owes other motorists and pedestrians on the road the duty to operate his or her vehicle the same way that a reasonable prudent person would have done so under similar circumstances. Any conduct by the driver that falls below this standard will constitute a breach of that duty. When the breach in this type of case is the driver’s direct failure to comply with traffic and safety laws, then the injured motorist’s best legal avenue would be to establish a personal injury claim under the theory of negligence per se. 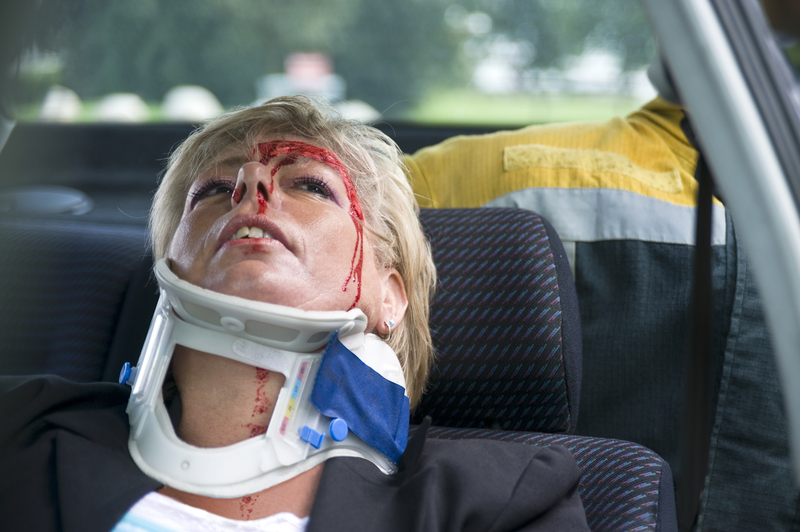 The strategical benefit of suing under this legal theory is that the injured motorist no longer has to prove the driver’s negligence because if we can show that the driver’s violation caused the accident that injured the motorist and as a motorist on the road, the injured motorist was a member of the class of victims that the statute was designed to protect in the first place, then negligence can simply be inferred by driver’s violation of the specific statute under the California Code of Regulations for Motor Vehicles. For example, California Vehicle Code section 22356(b) makes it illegal for a person to operate a vehicle over the 70 miles per hours speed limit by one to fifteen miles per hour. If your spine was injured in a motor vehicle accident with a driver who was speeding at the time of the collision, you meet the requirements to bring your personal injury claim under the theory of negligence per se. This means we can infer the driver’s negligence by his or her failure to comply with the established speed limit of 70 miles per hour under California Vehicle Code section 22356(b). We would then proceed to proving the element of causation by establishing the connection between the driver’s breach and the injury that you suffered, showing that it was foreseeable that this would happen. In our example, we would show that the driver’s operation of the vehicle at a higher mile per hour rate than the 70mph rate that the flow of traffic was going is what caused the driver to lose control of the vehicle and collide with you; that upon impact with the vehicle you came into contact with a foreign object that injured your spine. This foreign object could have been the glass from a shattered windshield, a collapsing roof, a crushing door, another passenger or their seatback as well as any projectiles that are present in the vehicle at the time of impact. After all, it was foreseeable that driving at such excessive speed the driver would not be able to control the vehicle, causing it to collide with other motorists on the road like yourself and that the immediate impact of a crash of two vehicles being driven at more than 70 miles per hour would result in a tragic injury like the one you suffered. In order to prove damages, we would need to establish the severity of your spinal cord injury, this could be done by showing that the stronger the blow causing the injury the more damage that resulted and that the closer that your injury is to the brain, the more severe the damages are. We would begin by having our traffic collision reconstruction specialist recreate the point of impact of the accident at the speed that the two vehicles were traveling to demonstrate the strength of the blow that you received to the vertebral column. Next, we would have one of our spinal cord injury medical experts provide an account of the vital role that the spinal cord plays in the central nervous system and the correlation of the location of your particular damaged spinal nerves and the loss of or altered form of motor function, sensitivity, bodily functions, and sexual functions that you have suffered. Lastly, we would provide a personal accounting from you of your day to day life to provide a better understanding of the extent of what you and your loved ones lost in the accident. Economic damages for spinal cord personal injury awards would include all past, present, and future medical costs, any lost wages and the loss of future earning capacity, all in-home adjustments and vehicle disability accommodations that need to be made to assist you in your current and future condition. The noneconomic damages would include the mental anguish, emotional distress, physical pain, social withdraw and loss of enjoyment of life caused by your injury. At San Diego Injury Law Office, we understand that after suffering a tragic spinal cord injury there is no amount of compensation that could possibly make up for your devastating loss, but we would like you to make an informed decision because spinal cord injuries are life-long disabilities. As the victim of a personal injury claim you have every right to hold the person responsible financially accountable for all of the consequences of their negligence. If you were involved in an accident with a negligent tortfeasor and sustained a spinal cord injury, there is no reason for you or your loved ones to have to live with the financial burden of this disability. Please feel free to give us a call anytime to discuss the full extent of your options at (619) 343-2992, our spinal cord injury attorney are here to protect you and your loved ones!